Is this the harp played in orchestras? At what age can you start lessons? What size harp should I get? Can I rent a Celtic harp? Should I buy a harp on the Internet? I've tried to answer the questions I'm most often asked. If you'd like more information about harps, chances are that others do too. Help everyone by contacting me at info@harpfolk.com. I'll give you my best answer and post it here for others to see. The Celtic Harp is an ancient folk instrument traditional in the Celtic countries of Ireland, Scotland, and Wales. 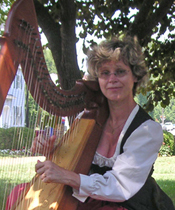 Celtic harps have eight strings to the octave, with sharping levers to raise the pitch of a string one-half tone. Think of harp strings as the white keys of a piano. A freestanding floor harp can be of any size, counted by the number of strings it has. (21, 27, 32, 34, 36 are common).. I play a Double Celtic harp which has two rows of strings (one for each hand) containing a total of 64 strings. The Triple Harp is a Welsh instrument with 3 rows of strings. The middle row contains sharps and flats, and is a truly chromatic instrument. No. Concert harps are quite large (to be heard among the other instruments) and have pedals to get sharps and flats. The harp is not difficult - you can't make an unpleasant sound! Here are some of the advantages to choosing to learn harp:. Strings are layed out like the white keys of a piano - low notes to high notes, all in a straignt line. You can't play chords with the melody..
You need to shorten the strings (with your left hand) to make different notes. The layout of the strings can be confusing..
Learning how to use a bow (with violin) can be difficult. I recommend lessons to children who have an idea of Tune and Timing. (Can your child sing nursery rhymes?). What size of harp should I get? Smaller harps are easy to carry. Larger harps have more strings and make a deeper, richer sound. Larger harps are more expensive. Some music stores (especially those that carry acoustic instruments) rent harps. What should I look for when buying a harp? Should I buy a harp over the internet? I get this question more than any other. Expect to get (at most) two of the three. 1. Quality and Speed do not come cheaply. 2. A Low Price and Speedy Delivery usually means that the product is not the best Quality. If you buy something sight unseen, it will be smaller and less well made than you think! Do not rely on pictures - little things will look big. A small bread plate and large dinner plate look exactly the same (unless they are in the same photo). Trust me - you will not get the harp of your dreams for $200 on eBay. Remember the old adage - "If something seems too good to be true - it usually is "
3. High Quality at a Low Price (What we all want) - takes time. search for a special deal.